Now here’s a thing I had no idea my girlfriend even owned. I am told I should have no reason to worry. “Zombies,” nuthin’. At $6.99 a pop, these are cheap enough to arm every kid in the neighborhood with one, and watch as passerby realize that oh good gravy, all the children are chasing each other around with bloody axes! Let’s get out here, Mabel! 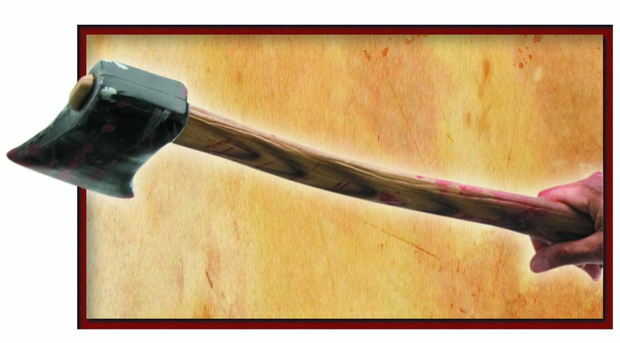 Anyway, it’s a bit nutty, but not nearly as crazy as this, if only because there’s a greater chance of getting nearly seven bucks’ worth of entertainment out of a fake axe. 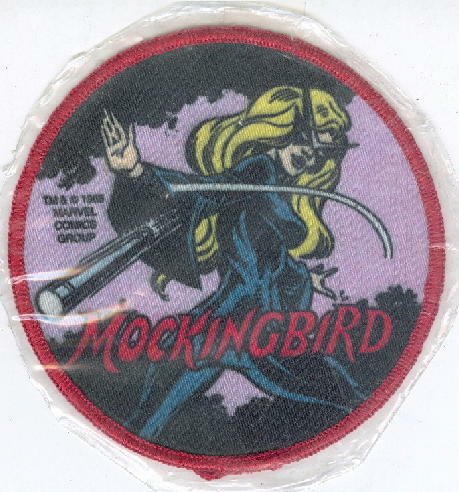 This post features a scan of a Mockingbird patch from 1985. 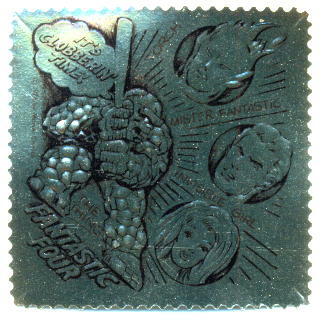 I could talk about current comic news and review recent releases, or I can look at more 1970s Marvel Super Hero Stamps. I know which I’m choosing! 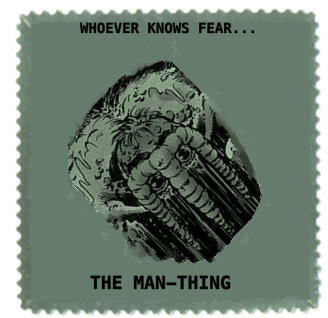 …that contains several uncut sheets of said stamps. 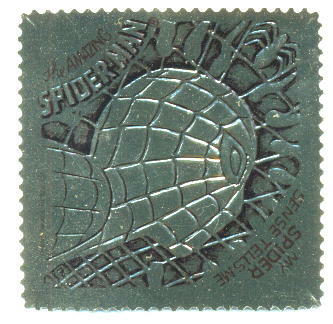 Since each package is supposed to only contain 10 stamps, plus one “special stamp,” obviously this package was only kept to store the stamps. 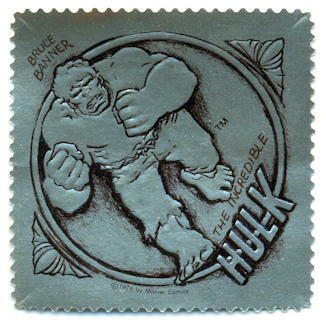 Why the original owner didn’t go out “get [his] own Marvel Stamp Album,” as is blurbed on the back, I do not know. Below are the five “special stamps” that this person had…they are normally sort of a shiny gold-ish color, but they didn’t scan all that well. Or rather, I didn’t scan them all that well. Should probably look at the scanner’s instruction book one of these days. Your Spider Sense is telling you…what? There’s a spider above your head? 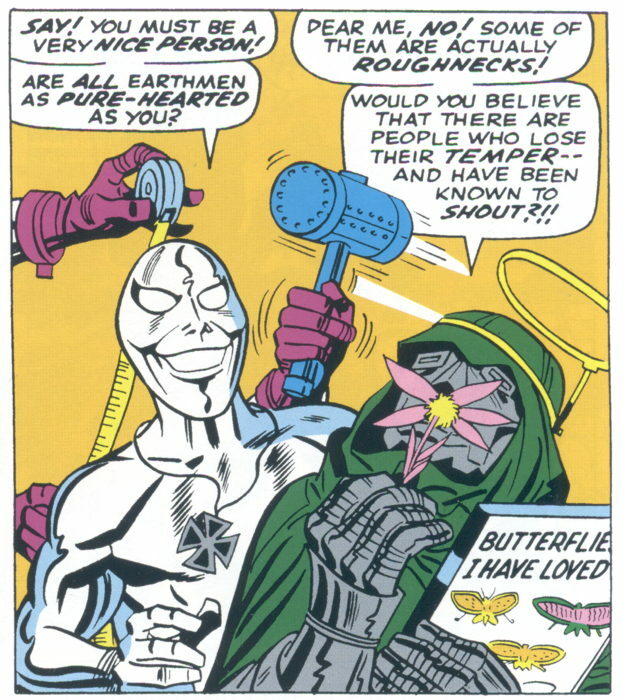 I’ve got nothing snarky to say here. That’s actually not a bad pic. 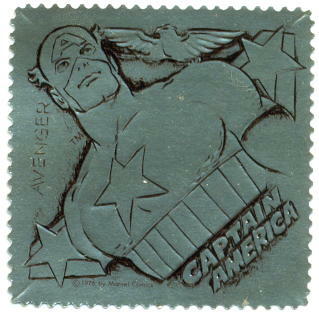 Well, none of these are really bad pics, but I thought this Cap stamp was quite nice, even with “AVENGER” scribbled in there at the side. 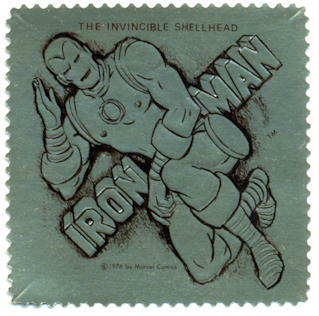 Now I know “The Invincible Shellhead” is just combining two of Iron Man’s most common descriptors, but man, that just doesn’t look right to me. …but a boy can dream, can’t he? Found in the back room. § April 2nd, 2008 § Filed under merchandise Comments Off on Found in the back room. 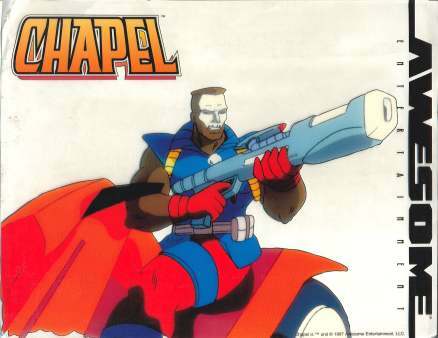 This is an ersatz animation cel featuring Rob Liefeld’s character of Chapel, dated 1997, that we received for, I don’t know, ordering a certain number of comics (i.e. “any”) published by Awesome, or something like that. It’s just an image, with logos, printed directly on a clear plastic sheet. EDIT 4/1/2017: Okay, it doesn’t say that anymore…now it’s “needs verification” or whatever, which isn’t nearly as amusing.